The problem with the Hindu idea of karma is that it relies on some universal force without intellect, or reason, that isn’t a person, to keep track of all the wrongs every person does, and then dole out justice. We seem to readily accept this notion, but rule out the Biblical standard of, “You reap what you sow.” In this notion, there is an all knowing, all powerful, perfectly intelligent, flawlessly reasonable, perfectly just and righteous judge, who knows every sin, of every person, and then uses those people in their sinfulness, to accomplish His will. We know from reading the Old Testament, that when Israel sinned, God would punish them by using a sinful pagan nation to come in and militarily defeat them, or enslave them. This was God using sinners to punish sinners in His sovereign will. This would cause Israel to see their sin, because they believed in Him and knew that they were being disciplined for their sins against Him. They would then repent, and turn back to Him. When we are being disciplined for sin, we should do the same thing. Repent of our sins, turn to Christ, and believe on Him and His work on the cross to justify us to God. We should not trust in our goodness, which is actually not goodness at all when compared to the perfect goodness of God, but rather it is sinful unrighteousness. 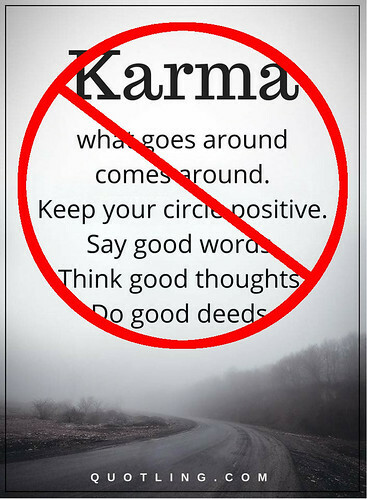 We need to give up on karma, which is a Hindu belief, and trust in the One true and living God, Jesus Christ. Yes! I cringe when I hear professing Christians reference Karma. It is the proverbial camel poking his nose under the tent.